Ok, we all know that after lolling around all summer, it’s time to hit the gym. Of course we know The Pearl has a fabulous state-of-the-art Power Gym with yoga and Fitness On-Demand®. And you promise to schedule your workouts faithfully, right? 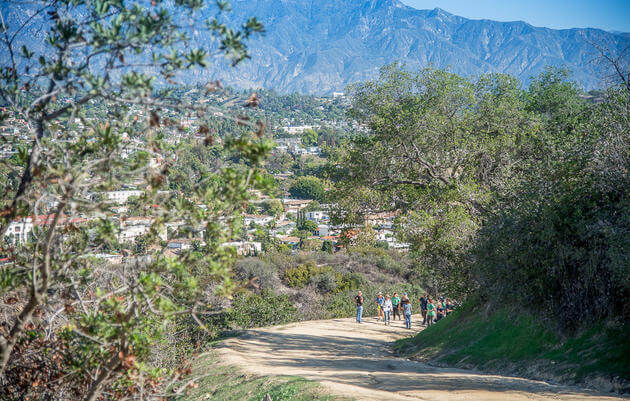 But with this glorious weather and the first signs of fall nipping at our heels, it’s time to go take a hike––and explore some of LA’s best kept secret urban trails. If you’re like most Angelenos, you’ve probably zoomed past this park just off the 110 Arroyo Seco Parkway countless times, and never knew it was hiding in plain sight! 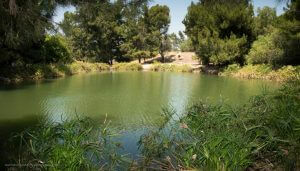 Ernest E. Debs Regional Park, a 300 acre urban oasis on old ranch land in the Arroyo Seco neighborhood just northeast of downtown L.A., is the fourth largest park in the city of Los Angeles. More than half of the park is covered in walnut-oak woodland, grassland, and coastal sage scrub, and over 140 species of birds have been recorded. A five mile loop meanders through almost every section of this dog-friendly recreation area, and along the way you’ll discover barbecue pits, picnic tables, a bike path, and a pond where you can actually go fishing. Stop by the Audubon Center at Debs Park, which opened in 2003 as an environmental education and conservation center, and was the first LEED platinum certified building in the country. The Corralitas Rail Path is a little known urban hike that follows an abandoned Pacific Electric Red Car Trolley line that used to run between downtown Los Angeles and the city of Glendale. Abandoned in 1955. this mile-long strip has been reclaimed by nature and is now a verdant woodland in the densely populated Los Angeles suburb of Silver Lake-Elysian Valley. The trail begins on a modest street corner, where Allesandro Way makes a sharp left hand turn at the intersection of Lake View Avenue. There is a small sidewalk that continues along the canyon running parallel to the Glendale Freeway. In just under a tenth of a mile, the sidewalk approaches the end of Corralitas Drive, where a small open space reveals the first visible stretch of the old rail line, leading into a wooded canyon and eventually opens up on the hill behind the Arco station at Fletcher and Riverside Drives. Along the way, you’ll see remnants of a 100-foot tall trestle bridge, old water/sewer infrastructure, abandoned stair platforms, and a steep hill covered with strange cement obelisks. Not recommended for night hiking! Nestled on the southwestern slopes of Mount Washington, Elyria Canyon Park is a 35-acre nature park that provides a glimpse into the native habitat that once thrived in the hills near downtown Los Angeles. A network of trails meanders through lush groves of coastal sage scrub, chaparral, grassland and purple needlegrass. 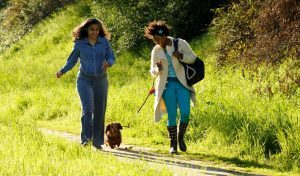 The park boasts one of the finest examples of California black walnut woodland in Southern California, with lovely trails that lead to vistas of the Los Angeles River, Griffith Observatory, and DTLA. The main entrance is located off Wollam Street in Glassell Park. Leave the paved road for a dirt path through thickets of sumac and bay laurel trees. Keep zigging and zagging until you reach a grassy bowl, where you’ll find a bench and welcoming drinking fountain. 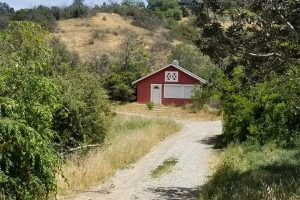 Walk a bit farther and to see a perfectly charming and totally unexpected little red farmhouse!